Launch of the Greater Birmingham Transatlantic Chamber of Commerce (GBTCC). L-R Lauren Hunt, Professor Julian Beer, Mandy Haque and Paul Faulkner. Greater Birmingham Chamber of Commerce is spearheading a fresh drive to promote trade with the USA and Canada through the creation of the Greater Birmingham Transatlantic Chamber of Commerce (GBTCC). 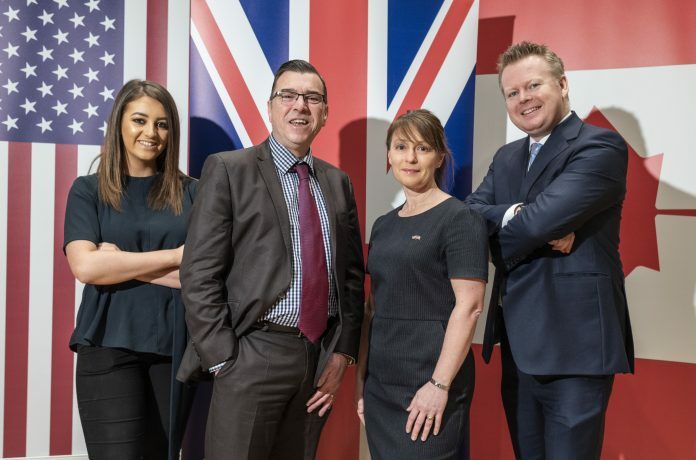 The revamped organisation will remain part of the global British American Business network, which spans across 23 chapters in the UK and North America. The organisation’s transatlantic conference is also returning to Birmingham for the second year running taking place on 27 and 28 June at the Royal Birmingham Conservatoire. Professor Julian Beer, president of the Transatlantic Chamber and deputy vice-chancellor of Birmingham City University, said: “Given a wider reorganisation of the British American Business Council, this is a perfect time to strengthen the relationship between the BABC Midlands Chapter and the rest of the group, hosted by the Greater Birmingham Chamber of Commerce. The Transatlantic Chamber of Commerce is to play a significant role in helping Greater Birmingham businesses trade with North America, as many firms seek new markets in a post-Brexit world. For more information on becoming a member of the Greater Birmingham Transatlantic Chamber of Commerce contact Lauren Hunt on l.hunt@birmingham-chamber.com.